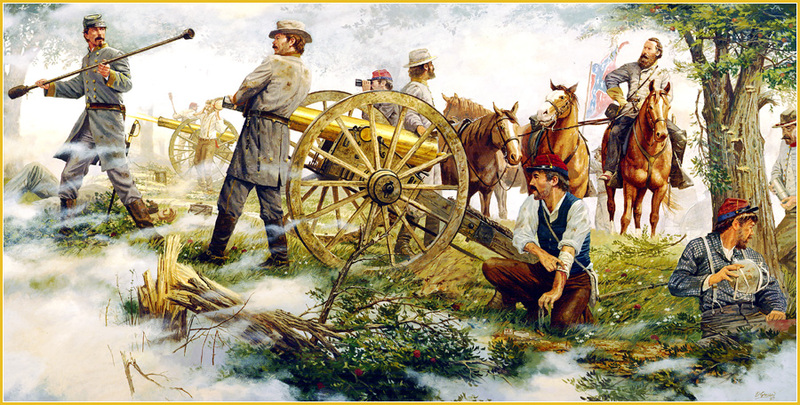 This site explores the world of 21st century Civil War art and examines the significance of these visual portrayals in shaping an understanding and interpretation of a crucial period in this nation's history. 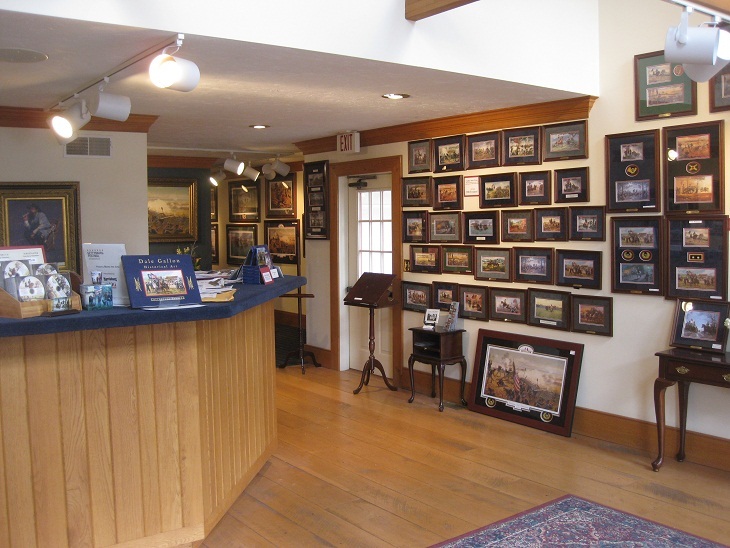 Gilbert Ouderkirk has made the annual eight-hour pilgrimage from Ontario, Canada to Gettysburg, Pa. A welcomed face in the Dale Gallon Historical Art Gallery, Ouderkirk made his first trip to Gettysburg years ago with his wife after reading about the Civil War. Being Canadian, Ouderkirk found the American Civil War fascinating and started ferociously reading accounts of battles, events, and turning-points of the Civil War. 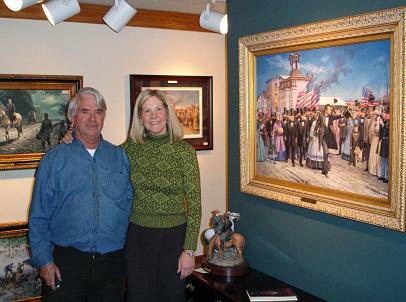 Ouderkirk has over a dozen Dale Gallon Commanders Series pieces that he proudly displays in his home. Among his favorites are anything with Gen. Longstreet and Gen. Lee. He does have a mixture of Confederate and Union pieces but admits his eye is mostly drawn to the South. As he toured around the gallery he admitted, “I’m mostly just trying to find room to put these paintings in my house, you can’t just put them in a closet, eh?” he cheerfully said. He points out the social relevance might be stronger with American’s but admits when he has guests over he always shows them his collection. “It’s great that you can come here [Gettysburg] and something you tour every time you come well there’s a painting of it,” he said. Ouderkirk finds himself stopping at different paintings he has had for years and sees new elements in them each time. “The paintings are a window to the past. When you look at it [painting], well there it is and there you are,” he said. How are the works of Mathew Brady relevant to today’s historical renderings of the Civil War? It’s true that not all photography accurately captured the action of battle, usually showing the aftermath of a fight was safer, easier, and put less stress on the equipment. Most of the photographs depict the dead, moved closer to each other to create a visually impactful piece, or enhanced with weaponry, a sought after commodity that wouldn’t be left with the dead. Yet, Brady captured the faces, uniforms, encampments, and way of life of the soldiers of the Civil War, as an extremely important historical reference. 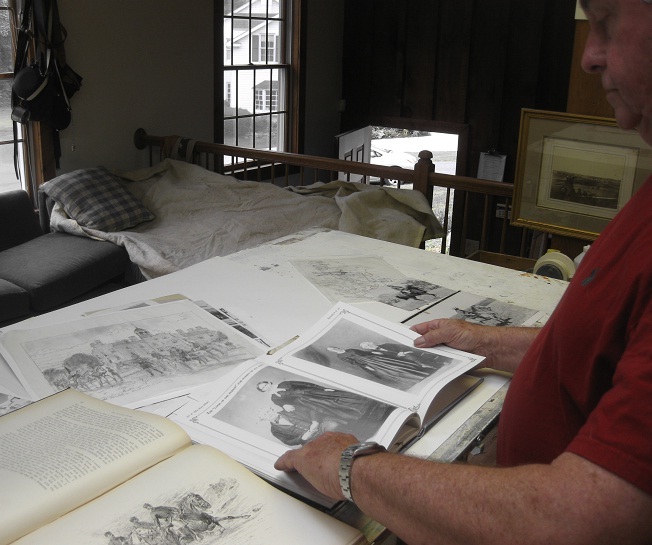 Painters, historians, movie makers, and the general public understand the way of life during the Civil War because of the painstaking photo documentation of Brady and his team. Dale Gallon uses photographs as a second source, relying heavily on first hand accounts penned in journal entries, letters, and documents but he then consults photography. He approaches photos with caution, looking for inaccuracy first and then observing the subtle details, how a uniform wrinkles, how tall the soldiers were, what the horses looked like after being in battle for days. A photo, as a secondary resource helps provide visual ques that written documents do not contain. The marriage of first hand accounts and photographic depictions are key in formulating an accurate painting. Ken Burn’s The Civil War was largely formed around the historical photographs of Mathew Brady. Ken Burn’s PBS website represents this important photographic documentation with three interactive displays for users. Visit Images of the Civil War and design your own movie, explore photographs under a lens of discovery, and browse through thousands of images of the Civil War. Gallon starts by conceptualizing an idea. This summer he is working on a commission for The Lutheran Theological Seminary, who initially asked for four historically accurate representations of their location during the Civil War, their only requirement, have the seminary showing in a specific area of the painting. Gallon starts by researching and looking at old maps, landlines, photographs of the town and seminary and consults Wayne Motts, Executive Director of the Adams County Historical Society. They quickly realize that the small house and white picket fence displayed in period pictures still exists. The view of the seminary is geographically correct and they have a base layout to build the painting around. This particular piece has a man riding into town and townspeople in action. Gallon creates four scenes around the historical event using first-hand accounts of journals to format the forefront action. His sketches are approved by the historians he is partnering with for the piece and then shown to the customer. The seminary chose one of four sketches for its visual interest and historical accuracy. 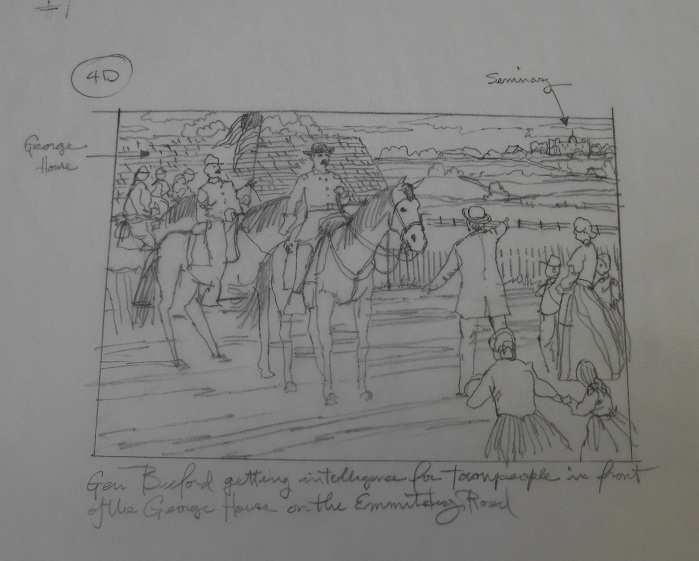 While Gallon explains the process and shows his sketches, visual aids of photographs then and now, he points out that the building still stands in Gettysburg today, highlighted by a white picket fence. Gallon uses live models, pictures of soldiers, and 3D models of horses to get the muscles, movement, and every wrinkle in the men’s clothing accurate. 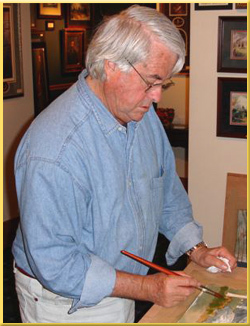 He works on a composition which allows him to display the light in the painting accurately, creating a third dimensional tone. This allows the painting to have depth and makes it believable. If the brain doesn’t detect any divergences then he has been successful. During this time, he researches what the weather on that day was like, which way the wind was blowing, and other elements, subtle or standout that may have occurred on that day. Gallon explains that wind, especially during battles was crucial to the outcome. Depending on which way the smoke would carry, enemies could ‘read the sky.’ The wind is also important in capturing movement of flags, etc. Once Gallon feels comfortable with the rendering, he will transfer the work to canvas. The first step is covering the canvas with a transparent wash, this allows for tonal work, and helps create the dimensional look once more paint is added. The wash can be a warm or cool tint, depending on the weather or feel of the painting Gallon is creating. Gallon then paints the background landscape, sky, and hills to create distance. Then he continues his way to the forefront by layering paints. He keeps each layer thin which captures dimension. Detailed items such as close landscape, uniform embellishment, and weaponry are painted last. aprons, patterns, boots on townspeople, and how a hat is resting on a young girl’s head are all up for scrutiny. As he continues he shares with the historians his ideas and many times they show historical evidence that an outfit is slightly off. Gallon is use to these small changes and welcomes their feedback. He is adamant about assuring a historically accurate painting so if he has to make changes to a piece, he does. Gallon said he would rather be critiqued in the studio then have an art historian or Civil War collector point out an inaccuracy in his gallery. Many of the pieces that Gallon makes are commissioned by museums or institutions. These paintings demand accuracy as Gallon’s work becomes the hallmark of history. He puts the same painstaking work into each piece because he understands with each piece he is making history. Once Gallon has completed a piece, he makes prints to offer in his gallery. The canvas is photographically scanned, the machine pixilating colors. “Each of the four main printing ink colors, cyan, magenta, yellow, and black, are separated out of the image and placed on their own individual layer of film. The screens are laid in four different angles when printed in order to create a ‘rosette’ shape – thus appearing a solid color. The dot size of a limited edition print is so tiny a person would need a special magnifying glass in order to see them,” says Gallon. Gallon then inspects the proof for coloration and accuracy against the original painting. Then the print goes into production. The final step for the prints is inspection, matting, and framing. Gallon takes great pride in the matting of a piece and extrapolates colors out of the print to choose a matting package. He also numbers and signs each piece, signifying his approval. The prints are ready for purchase. The rolling fields of Gettysburg come alive with reenactors, statues to Civil War legends and Dale Gallon’s art. Gallon has a seeded love for the Civil War that comes from gingerly flipping through his father’s Civil War portrait books at Christmas time in Southern California. Enamored by the vivid colorations and stately looks of Generals in battle, Gallon remained mystified by the action scenes and fields of Gettysburg where historical battles erupted. Galleries/Museums: U.S. Army War College, the Pentagon, Fort Leonard Wood, MO, Tanenbaum Park & Guilford, Battleground in Greensboro, NC, Virginia Military Institute, Command and General Staff College in Leavenworth, KS, Minnesota State Capitol, and private collectors. Painstaking research goes into every Gallon original and it’s not just Gallon alone that creates the final rendering. 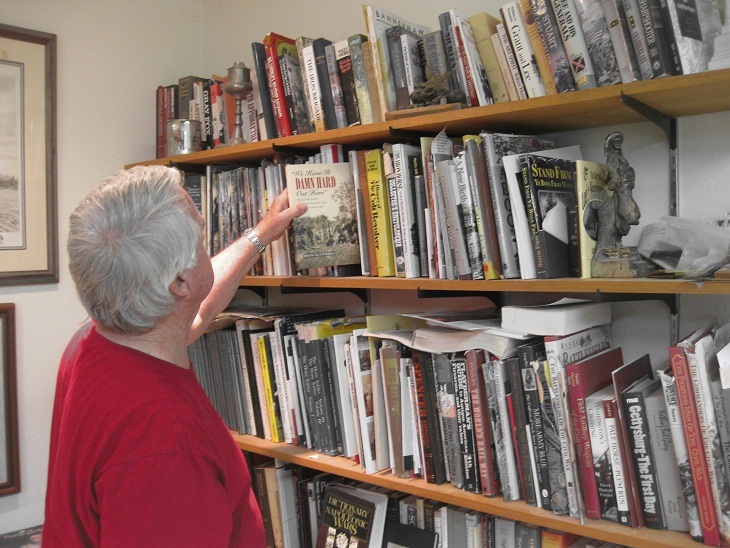 He relies on a team of historians, professors, and Civil War experts to ensure an accurate glimpse into history. 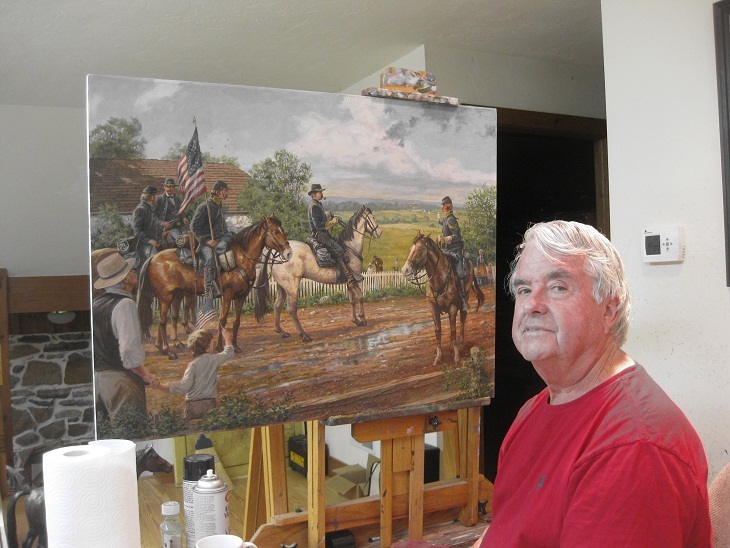 On one of my visits to Gallon’s studio in Gettysburg, he explained to me the concept behind the painting and all of those involved in getting a final piece completed.